I'm participating in the 2015 Stash Bee this year. It's the only one I've signed up for since I'm still participating in Compass Quilter's as well. I'm amazed that I was able to finish this up as quickly as I did given the fact that 1) it's paper pieced, 2) my son is sick, and 3) did I mention that it's paper pieced? You can read my post on the Stash Bee blog here. I really do like how you can get beautiful points using paper piecing but I really have to re-train my brain to not be frugal. My first instinct is to always try and use scraps so as not to waste anything and it always get me in trouble. Every. Single. Time. Luckily, this came together pretty quickly. I hope the colors are what the recipient is looking for since my stash seemed to be very limited in the selection of lime green, teal, and raspberry (I didn't have any of that color). She's a very pretty block, Diana. Hope you son gets feeling better soon! Your block turned out perfect. Beautiful colors! Looks great - I'm in Hive 3. Will look out for your posts! 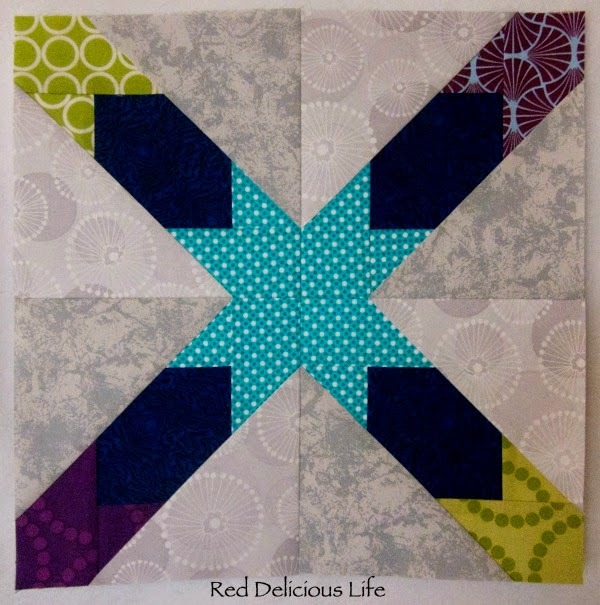 Oh dear, did I mention that my Compass Quilters' block is going to be foundation paper pieced? Please don't hate me! I hope the little one is well again soon!